A long time ago, I went to a school called Chislehurst and Sidcup Grammar. It was a good school: very academic and very sporty. Purple blazers. It was about as close to being a public (i.e. private) school that you could get without paying large sums of money. At one time, Chiselhurst and Sidcup was officially the second best school in the country (after Manchester Grammar). Then one day the school became famous. Front page of every national newspaper. On the editorial pages for about a week. Suddenly, Chislehurst and Sidcup was a symbol for everything that was wrong with the country. I was a part of that and this is my story. I had already left school to join the Navy in 1982 but all of my friends were still in the sixth form when I came home for Christmas holiday. Come to the Christmas Party they said. Of course I said. Why wouldn’t I? Make sure you bring beer my friends told me because we are only allowed beer, wine or cider. Nothing stronger. So I brought some beer. Most people did. Mr Gooden brought a couple of boxes of wine. Mr Gooden saw me going into the sixth form centre where the party was to take place. Where are you going, Kevin? He asked. He checked my bag and, when he saw that it was only beer, he let me in. Spirits were high. Lots of dancing. Lots of singing. Apart from that one kid who threw up, no one really got drunk because we had all been having beer at birthday parties since we were thirteen. The highlight for me was when Come On Eileen came on and everyone held hands in a big, boisterous circle and sang with lung-bursting joy. I got to hold hands with Jo Burston (who I had wanted to hold hands with for 4 years) and we danced together for the rest of the afternoon (and the next three years). …until the second week of January. Suddenly, our party was on the front page of every national newspaper. Every op-ed page had a stern reflection on alcohol in schools. A few papers had 6 page special features on the evils of drink. The Sun had an editorial cartoon. I called Jo that night to find out what was going on and she said she was suspended. The whole sixth form had been gathered into the assembly hall and given a lecture. The headmaster called out some names of kids who admitted to being at the party and said they were suspended. Other kids then said I was at the party too then more kids (I imagine I am Spartacus! I am Spartacus!) until finally the headmaster said everyone who was at the party should just go home because they were all suspended and the whole sixth form walked out. Can you believe I actually tried to write an A level standard essay on Chaucer from scratch at said party ? I mistakenly thought that the party wouldn’t start until lunchtime, so at 9.20 there I was perched on a chair, scribbling away on my lap with a raucous party going on above my head ! I couldn’t remember the correct title – should’ve been something like ‘Discuss Chaucer’s use of comedy in the formation of various characters in the Prologue’ whereas my essay was entitled ‘Who’s the funniest character in the Prologue?’, like some kind of cheap gameshow !! Needless to say, I managed just over a page of A4, got marked about 2 out of 20, and had to do it again ! I was there too! I was one of those suspended along with my friends Beverley, Corinne, Fiona, Vicky, Paul, Neil, David (surnames witheld to protect the guilty!) When I went for an interview at York University a few weeks later, the student showing a group of us around said “Which one of you is from Chislehurst and Sidcup, ‘cos you’ll be wanting to know where the bar is …” Funny! And I was threatened with another suspension when I wore a t-shirt with this cartoon on it for games. As Helen Walsha says, Happy Days!! I wasn’t there. Well, I wasn’t at the party, but I was at the school in the sixth form. I can remember too much about the day, except that there were accusations that some of the teachers knew what was going on and, I think, two of the kids were taken to hospital to have their stomachs pumped! couple of people being suspended the whole thing was greatly exaggerated. I was astonished that it was in the Sun and of course bursting with pride that we were so notorious. It took place in the sixth form hut and tonight Friday May 12th 2017 they are having a reunion. 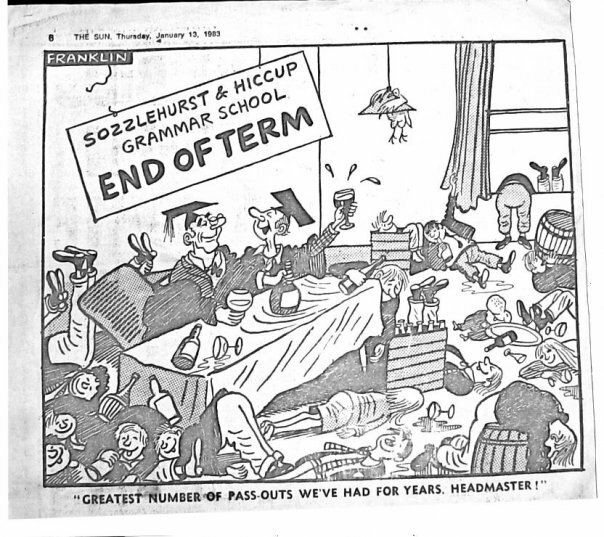 The trouble is I think the people organising it were in the year below in the lower sixth and I am deeply confused because I swear the year involved was the upper sixth. I am a touch bemused by the motives of going to a party, celebrating a party that most people attending didn’t actually attend. I might be wrong of course ( damage to brain from drinking at such an impressionable age) but I never thought I would be in a position of being one of the elders that lives to tell the real tale before the myth became a legend! Illuminati and suspended for a week immediately on return in Jan. This wasn’t enough for a couple of the senior teachers who insisted the Mr Sennet take more action. So we were all summoned to assembly on day 2 of term and told to confess out sins the following morning, in person, at the heads office. I think he figured the more radical types would show up. If you recall, an impromptu meeting was called in the 6th form centre at 8.30 to discus the matter. General view was all or none. So it was all. I will never forget the elation, and fear, as 200 sixth formers marched from the centre to the main entrance. JS appeared at his door and turned a nasty shade of puce, the ordered us all into the hall. Hahn the came in and first tried to get every one to go away and have a think. Much laughter. He went away and came back to ask every one to sign a confession. Even more laughter. Best bit then when teachers were banished, sentrys posted and private discussions ensued. Upshot was a few who were not involved or didn’t want to face the music, left the hall. 250 or more stayed. JS entered and tried to patronize us. Bad move. 30mins later we are all suspended for a day. The rest is history. Mostly fiction in the papers I agree. Epilogue. Someone PB I think, painted over the sign at the Hurst Rd roundabout, so we’ll it was a few days before anyone noticed. The caretaker took the sign down, not wanting the council workers to get it. He kept it in the store room. I had a set of keys. Guess what Ian and I liberated on the last day of school? I still have it in storage in France. Happy Daze.